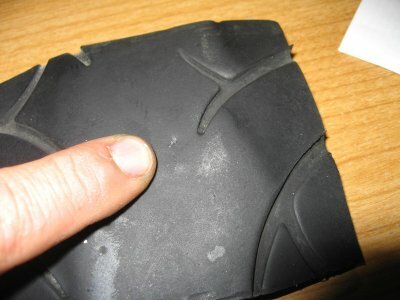 Please give me your opinion and advice on plugging motorcycle tires. Is it safe? How far can you travel on aplugged tire? Is it recommended? Good question. You are going to get some polarized answer. I have heard tales of plugged tires (both the string & glue AND the mushroom types) lasting for many miles, and there will be some folks that say just ride on them until you need to change the rubber. IMHO the cost of a new tire is not too much for my safety and piece of mind. I see plugs on motorcycle tires being a temporary solution. Unlike a cage, motorcycles have a bit less stability. If a tire happens to blow out or loose pressure all at once at speed it can be hazardous. -- Steve Smith, COG #3184 COG Northeast Area Director (somewhere in south central CT) If you're not living on the edge, you're taking up too much space. I have to totally agree with Dave. I've used a Stop-n-Go plug for as much as 8K miles on (what was at the time of the puncture) an almost new ME880. I kept a really close eye on the air pressure and didn't push the envelope with cornering. HOWEVER, I don't recommend it. In retrospect I think that (besides being cheap and lazy) I was lucky. Plugging is a temporary measure intended to get you somewhere that can do a proper repair or replacement. Over the years, I have grown more comfortable with plugged tires, and I have run several till they were worn out. My preferred repair is to remove the tire and put a T patch on it from the inside, but I have run sticky rope plugs thousands of miles. The only thing I have noticed is that rope plugs may develop a slow leak after it gets a lot of miles on it. I'm talking about loosing maybe a pound overnight after it has 3K miles on the plug. As always, you should check the pressure in any tire that has been repaired more often than normal, for the life of the tire. On average, I plug about 6 or 8 tires every year, some my own, and others for folks at rallies who get nails or folks I see on the side of the road. I have yet to see a single rope plug not seal and fix a tire perfectly. HOWEVER, one thing I have had TERRIBLE experience with is the STOP AND GO mushroom plug kit. I plugged three tires with it, and not only did it fail on all three tires, but it also ruined all three of them for any further repair. The tool is so large in diameter it stretches out the hole and ruins the tire for any further use or possible repair, even with a patch on the inside. The heads of the plugs will also shear off, and there is no glue on the plugs and they can and do come out. I'm not the only one who has had this happen with Stop n Go either, there are dozens of reports of problems with them on various motorcycle boards.As a result I would recommend you NOT buy or use the Stop and Go kit. Another product I would recommend you stay away from is Ride On or any liquid type tire sealant or "Fix A Flat" goop. Not only will they not be able to plug a hole of any size at all, they will prevent you from using a proper plug in the tire because it will prevent the glue from working and the plug won't be able to vulcanize properly. There have also been many reports of corrosion on aluminum wheels caused by Ride On and other similar products. And if you have a C14 with tire pressure sensors, you don't ever want to put any liquids in it, as it will ruin the sensors. I have a couple photo galleries on line dedicated to tire repair: http://www.pbase.com/fredharmon/tireplug http://www.pbase.com/fredharmon/tpatch I have recently found a new kit that is great for small holes, and is minimally invasive, and is based on a sticky rope type plug. I have plugged two tires with it now, and it worked flawlessly. You can get it at Harbor Freight, or on line. It's called Dyna Plug. 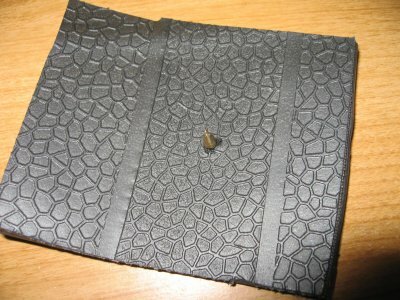 http://www.dynaplug.com/ Here is a photo of a section cut out of a tire I plugged with the Dyna Plug 1,000 miles later. Fred's comments are interesting regarding the Stop-N-Go plugs. I've plugged 4 tires with them with nary a problem (3 motorcycle tires, 1 truck tire). I guess the disclaimer "Your Mileage May Vary" definitely applies. I was worried about plugging on my bike but after having done it on the ME880 rear (sticky rope) that I got from the PO, I'm sold. The plug lasted the remaining useful life of the tire (6000 miles or so) and the tire performed normally throughout. I'd still be wary of plugging a front tire because while the back tire going out is bad, the front tire going out is disastrous. I'd also say that plugging a tire on bike or car is more a matter of where the leak is than whether or not plugging is safe and effective in general. The closer the plug is to the center line of the tread the safer and more effective it's going to be. The closer it gets to the sidewall the more dangerous it becomes. Sidewall damage cannot be safely repaired. +1 on what Dave said as well, if it's not a straight in puncture I also wouldn't trust a plug. Considering the cost of being wrong, if you have serious doubts about whether or not it's safe to repair a tire, take it to a shop and have them take a look at it. I want to thank everyone for their valuable information on tire plugging. It was very helpful!!! Here's another option for you. It's especially useful if you happen to get a flat on a new tire and hate the idea of not getting the mileage out of it. Put a tube in it. About 15 bucks gets you the tube. I had a dealer do this for me one time and told me it was perfectly safe. I've run plugs before, and did just fine, but the tube would provide you with more comfort level...at least it does for me. My ol school philosophy was to change out the tire or remove and really patch it. However now with the TPS on the C-14 I find I am not at all worried about it. I average a set of tires about once every 1.5 years or less, so the 8k miles I get will be up soon, and if I see a abnormal loss of pressure, I will inspect the tire a little closer. Like what others have said, I have not had a string plug even leak on me for 1000's of miles.